This is something from my husband's kitchen. 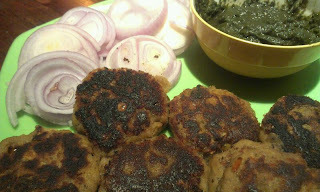 He makes it so yummy that even a vegetarian like me can not resist eating them. Take all the ingredients in a cooker and pressure cook them (3 whistles should be enough). Grind the mixture into a fine paste (Keep it in the freezer for 10-15 minutes if the consistency is not thick enough to make patty). Add salt. Heat some oil in a flat pan, make small round patties from the mixture and fry them till they turn brown and crisp from both the sides. Serve with onion rings, green chutney and paranthas.